There are lots of strollers on the market to choose from. In fact, there are so many different brands and models of strollers, it’s tough to pick one! 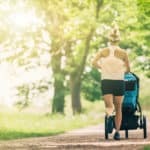 However, if you’re not into jogging with your child in tow, you don’t want a super-lightweight stroller that’s designed for travel, and you’re not about to trek across very rough terrain with your youngster, a regular stroller could fit the bill for you. In this article, we look at two popular regular, reversible strollers, The Ergobaby 180 and the UPPAbaby Cruz 2. We’ve drawn a comparison between the two so that you can easily see which would suit your needs and budget best. Let’s take a closer look at both these brands and their reversible strollers. 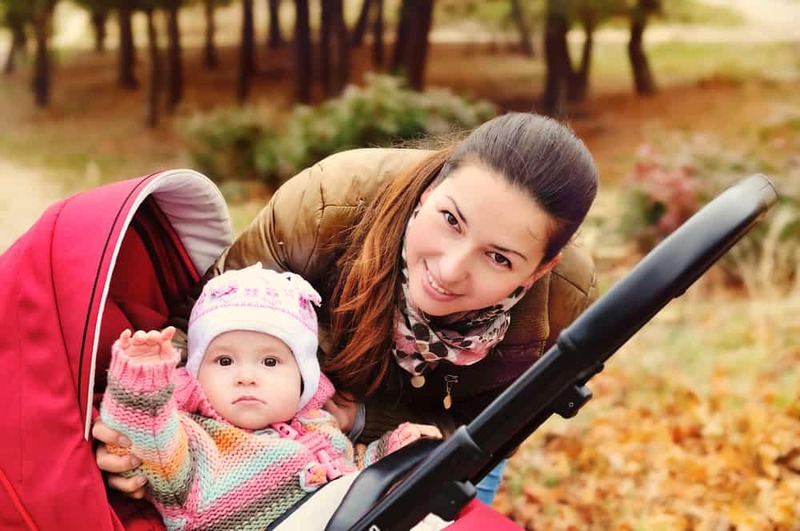 Ergobaby is a U.S. company that specializes in making and selling baby carriers and other associated children’s products, including a limited range of strollers. The company is relatively new on the scene, having been founded in 2003 in Maui, Hawaii by CEO, Karin Frost. Ergobaby’s primary focus is on the manufacture of baby carriers, and they’re only a minor player in the stroller niche. That said, Ergobaby’s products are all of decent quality and are designed with your child’s comfort and your convenience in mind. REVERSIBLE, ADJUSTABLE HANDLEBAR: Baby can face the world or you with the flip of the handlebar. Handlebar adjusts between 39" and 42" high. ONE HAND FOLD AND LIGHTWEIGHT - A full featured stroller weighing under 20 lbs. You can hold your baby in one arm & fold the stroller with the other. X-LARGE STORAGE BASKET - Big storage basket can fit large diaper bags and your Ergobaby carrier. Whether you’re carrying or strolling, the Ergobaby offers superb comfort for both you and your child. The 180 is a single, reversible stroller that’s packed with features for comfort and convenience. The stroller is compatible with many of the most popular makes of car seats, including Chicco, Britax, Graco, Nuna, and Cybex. The Ergobaby 180 can be used for a newborn right through to a toddler weighing up to 50 lbs. The Ergobaby 180 is so named because the handlebars can be flipped through 180 degrees, allowing you to stroll with your child in either direction. That’s a handy feature to have, especially if you have a child that doesn’t settle quickly or likes to have one eye on you at all times! In comparison, you need to detach the seat on the UPPAbaby Cruz to flip it, which is a somewhat more time-consuming procedure, especially if you have a fidgeting toddler to contend with too. The Ergobaby 180 has a few nice features that you usually have to pay extra for. Bonus extras include a pouch for your keys and cell phone, a parent cup holder, an extended canopy, and a peekaboo window with silent magnets. The Ergobaby 180 can be folded one-handed and while wearing flip-flops. All you have to do is pull up on the cloth handle in the center of the seat, and the stroller collapses neatly together. That’s fine if you have already had one of these but means extra expense if you don’t. It’s also worth noting that if you want an UPPAbaby Mesa car seat, you’ll have to buy the more expensive Cruz 2, as the Mesa is not compatible with the Ergobaby 180. Although the UPPAbaby Cruz is comparable to the Ergobaby 180 in that it has a large storage capacity, reversible seat, and self-standing fold, the Cruz is considerably more expensive than the 180. For your extra dollars, you get luxury details, including a leather handlebar and a belly bar. You also get the reassurance of a well-established brand name and a manufacturer’s warranty. There’s a handy snack tray that snaps onto the front of the stroller so that your child can enjoy something to eat while you’re out and about. Disappointingly, the snack tray isn’t included, and you’ll have to buy it separately. There is a cup holder that attaches to the stroller’s handlebar that’s included, which is a useful feature. The Ergobaby 180 can be used for babies under six months old, but to do so, you’ll need to buy a newborn comfort insert. Ergobaby recommends that you use this extra for babies up to 18 months old for head and neck support and to keep their legs in a healthy position. 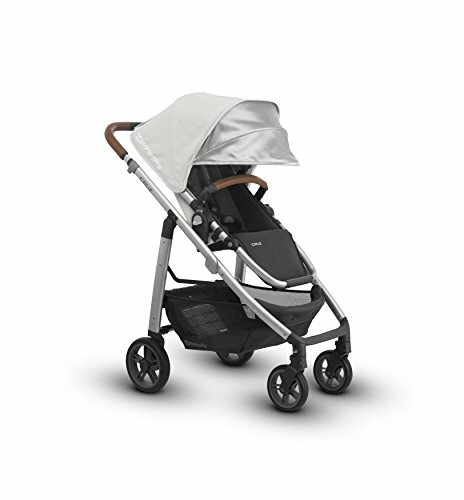 Although the 180 has a reasonably generous canopy, if you plan on venturing out in all weathers, you’ll need to buy a separate weather shield to keep your baby protected from wind, rain, and snow, adding to the cost of the stroller. The Ergobaby has a pretty generous canopy to protect your child from the elements. A neat touch is the roll-up sides that reveal netting, perfect for cooling your child on summer strolls. The Ergobaby 180 is very easy to turn, push, and steer. The stroller has four solid wheels of equal sizes that can be locked individually, allowing you to move back and forth or side-to-side smoothly and without getting stuck, which can be an issue with the UPPAbaby Cruz 2. UPPAbaby is a U.S. company that makes high-end baby products, including a wide range of strollers. 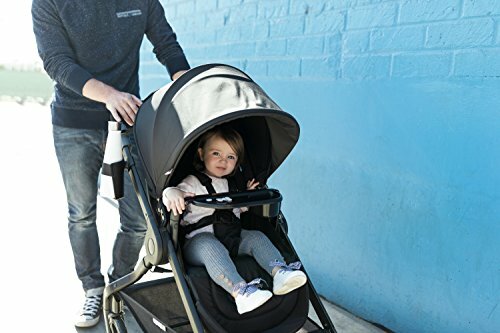 Established over 30 years ago, UPPAbaby is a very well-established and reputable company that combines style with practicality in all their strollers. Their products are light, easy to use, fun, and savvy, delivering superior comfort and safety for your child and convenience for you. 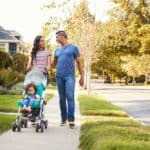 Although UPPAbaby doesn’t make the cheapest strollers on the market, they’re certainly up there with the best-designed and give you great bang for your buck. As you probably guessed, the Cruz 2 is the upgraded version of the original UPPAbaby Cruz. Like the Ergobaby 180, the Cruz 2 can be used for a newborn, but you’ll need to buy an additional carrycot to use with the stroller. Otherwise, the Cruz 2 is suitable for children aged from six months to approximately three years. The Cruz 2 is compatible with most car travel systems, offering greater flexibility than the Ergobaby 180. There’s a lie-flat carrycot too, enabling you to use the stroller for a newborn. But that’s sold separately and is not a cheap purchase. The Cruz 2 tackles grass, gravel, curbs, tree roots, and forest trails too giving your child a smooth ride thanks to an excellent suspension system. The four solid polyurethane wheels are sturdy and durable, so you’ll never be left stranded with a puncture. The Cruz 2 is not as light or easy to handle as the Ergobaby 180. Although it fits comfortably inside most large stores, you could struggle to maneuver the Cruz 2 down narrow shop and restaurant aisles or in high street coffee shops. Although the Cruz 2 is advertised as being easy to maneuver, it can feel heavy, which could be a problem for petite moms. Also, if you stop with the stroller’s wheels facing left or right, it can be challenging to get it moving again without pulling the whole thing backward first. That could be awkward and even potentially dangerous when crossing busy roads. The Cruz 2 is pretty straightforward to fold and will stand in a cupboard without taking up too much space. 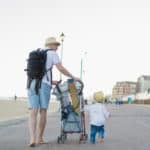 However, although this stroller is billed as a one-handed folding model, most people find that they need two hands to perform the folding procedure. 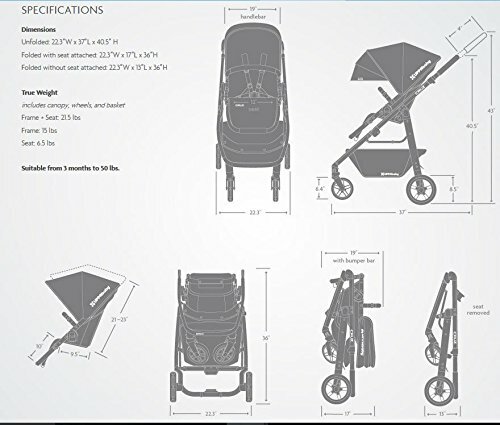 In theory, you can fold the Cruz 2 one-handed, provided you have the stroller in precisely the right position, i.e., forward-facing with the canopy pulled back. Like the Ergobaby 180, the Cruz 2 has a comfy, plush seat and padded crotch and shoulder straps to keep your child comfortable. The seat will take a child up to 50 lbs in weight, and the canopy can be extended by 2″ to accommodate a tall toddler. The seats of both these strollers have a five-position recline feature that’s perfect when your child wants to take a nap while you’re out and about. The Cruz 2 has a neat reversible feature, allowing you to have your child facing front or rear, depending on his mood. 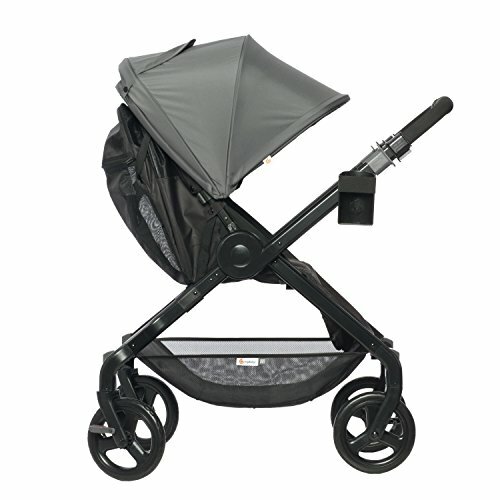 The handlebars are adjustable so that the stroller can be tailored to suit tall or petite parents. That means no risk of a backache! To adjust its height, you push a button in the center of the handle. Unlike the Ergobaby 180, the Cruz 2 has a hand-stitched, luxurious 100% leather handle as standard. Also, the leather used is REACH certified, so you know that it’s safe to be around your child. The Cruz 2 is more expensive than the Ergobaby 180, but it is built to last. You’ll get a two-year manufacturer’s guarantee, and, if you want to, you can extend that by an additional year for a small extra cost. The canopy is huge! Also, there’s a large UPF 50+ pop-out sunshade that extends right to the bumper bar to keep your child protected and comfortable on the hottest days. There’s also a peekaboo window with a silent magnetic closure, allowing you to check on junior without waking him. The Cruz 2’s canopy slides up and down the frame. So, you can extend it if necessary to accommodate a tall child, something you can’t do with the Ergobaby 180. The Cruz 2 has a huge storage basket that’s capable of holding up to almost 25 lbs! There are also three neat little storage pockets for essentials such as wipes, diapers, keys, and cell phone. Just be careful that you don’t get too carried away on shopping trips if you have an uphill walk to get home! Both these strollers are great for parents who are looking for a versatile, reversible stroller. 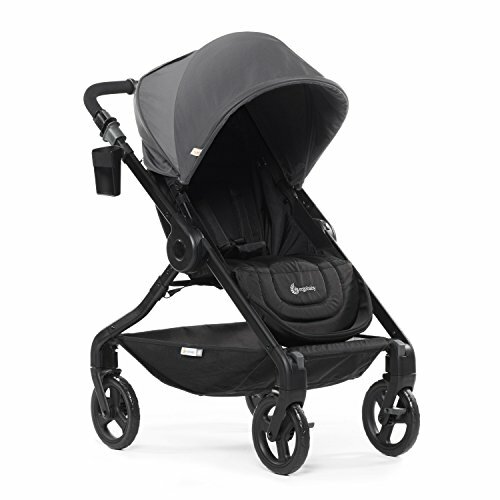 Of the two strollers we’ve compared, the UPPAbaby Cruz 2 is the posher pushchair! The Cruz 2 is extremely well-made and sturdy with some lovely stylish touches, such as the leather accents. If you buy this stroller, you’re buying a long-lasting ride that will last you through several children, not just one! The Ergobaby 180 is a nice product, but it lacks the quality finish and nice extra features boasted by the Cruz 2, hence the marked difference in price. That said, the 180 is more comfortable to maneuver and is more compact than the Cruz 2, which could be important to you if you frequently travel by car. Both strollers offer decent canopies, comfy seats, and ample storage baskets and both are reversible, although the Ergobaby 180 is easier to flip around. 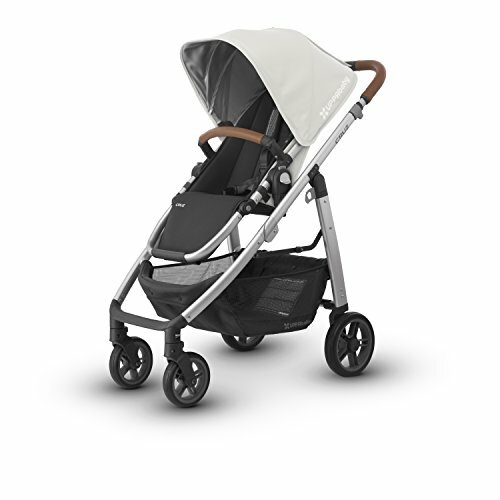 There’s a nice range of colorways to choose from for both these strollers, but the leather trim on the Cruz 2 make it the winner in the looks and style stakes. In a nutshell, if you want a good-quality, reasonably priced reversible stroller, the Ergobaby 180 is probably a good choice. If you have a more generous budget and you want a stroller that oozes style and quality, we recommend the Cruz 2, provided you’re not put off by the heavier push and slightly tricky handling.